Have YOU been anywhere educationally delightful? or submit a review by clicking HERE! Review: My family really loves the American West Heritage Center. On their "daily adventures" it isn't a high adventure outing, but it is very relaxing and fun. It is rarely crowded except during the big events. The kids like to help milk the cow and help in the garden, explore the farm, ride the train and ponies, pan for gold (which they exchange in "town" for candy) and write their name with ink and quill. 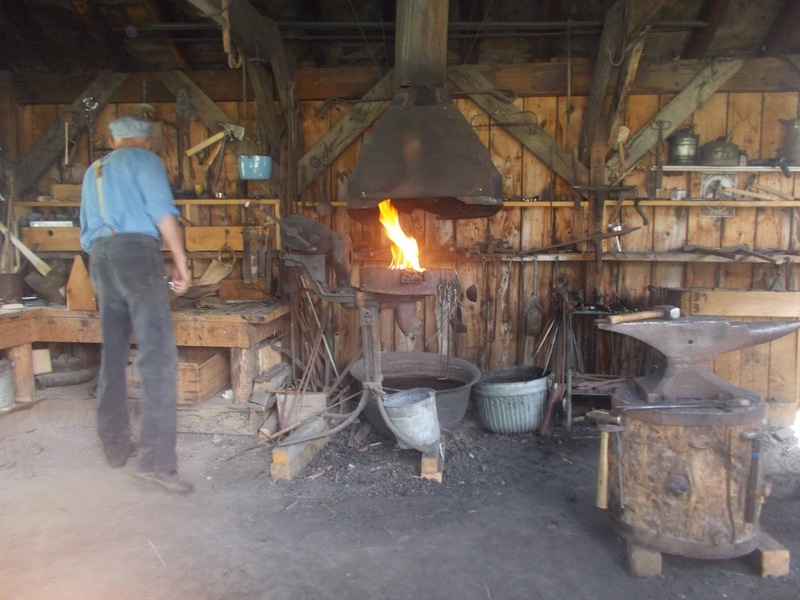 The blacksmith does a fun demonstration, and the woodsmith shop is fun to peruse. Occasionally someone will be there to do tomahawk throwing or laundry at the settlement. You can picnic on site, which is nice, and if you have a few dollars to spare there is a nice gift shop. If you live nearby and can go often, the family annual membership is very affordable. Review: This was a very fun field trip. We attended the Friday before Valentine’s Day! The staff is very friendly and was extremely knowledgeable on their history and the art of candy making! We toured their factory, seeing many wonderful sights. From the peanut packing machine, to the giant sized kitchen tools, to the secret cooling tunnel, and Pam and Jan the professional candy dippers, in action! I took my children ages 16 to 18 months, along with another homeschool family. The tour lasted roughly an hour, and was definitely geared to the younger children. However all the older youth and moms definitely had a wonderful experience. Both families were inspired to go home and make chocolate dipped strawberries, after seeing it in action! The space is not large, so I do not recommend too many strollers. I had my umbrella stroller, and honestly many times it was in the way. If you can carry or pack little ones that would be better. Tours can be for 2-15 people. Contact them through the website (link above) to arrange one! Review: If you are new to Utah, or Utah history, this monument is at Promontory Point, about 30 minutes west of Brigham City, and commemorates the east joining the west when the Union Pacific and Central Pacific railroads met in 1869. My family has been twice, both times to the anniversary celebration on May 10. The recreation of that historic moment is wonderful: people in costumes, a full verbatim, memorized script played by microphoned re-enactors. For history lovers like myself, this is a moving (tear-jerking, but I'm strange like that) opportunity to BE THERE. My family loves seeing the costumes and the trains. The re-enactment takes about an hour. This can seem long for little people. Also, there is no shade. There are bleachers to sit on, but they are set back a ways from the "action." If you rather be more comfortable and closer, bring lawn chairs, or (lighter) a picnic quilt. (I recommend a picnic sheet elsewhere on this blog, but in this instance, you are laying it over weeds and dirt, so a quilt is better protection and softer.) To keep little people occupied, THIS is the time to eat, though there was a food vendor open AFTER the re-enactment. For our most recent trip, we did the following, which made our time here a smashing success: 1) we dressed in period-appropriate costumes. Not only were we able to be in the "official photo," but we got movie-star treatment from other guests who wanted photos with us. (Nothing says cute like little kids in bonnets, I guess.) 2) We brought a period picnic. Inspired by the book I'll mention below, we brought meat pie, homemade lemonade, cookies, potato salad and hard-boiled eggs. I tried to keep it period appropriate and wrapped the food in dish towels and put it in shoe boxes. 3) We brought friends. We likely would not have had such a good time without my kids each having a buddy to "party" with. 4) I brought shade. Sitting close, you can't put up anything extensive or it will block the view of those behind. I wish I had a period parasol - a Chinese-style umbrella would have been perfect - but I had a regular umbrella and it was enough to keep me cool and sunburn free. (Consider sunscreen on little people not content to stay put in one spot.) And finally, 5) we studied the event before hand. We are ABSOLUTELY LOVING the "Dear America" series of historical fiction. My girls and I read the "diary" of Libby West, whose father reported on the progress of the Union Pacific. My older son read the "diary" of a young Chinese immigrant working on the Central Pacific line. Other notes: we have never explored the visitor's center much, but it seems small and old. Honestly, for the money if you go during the regular season, and if there is no re-enactment (Saturdays and holidays at 11 May - Sept.), I don't think the drive is worth it. I wouldn't describe the scenery as beautiful. Barren would be my word of choice. So if you go, hit a re-enactment, stay for the steam demonstration, and climb aboard both trains. Wear comfortable walking shoes (no heals) and bring a wagon instead of a stroller (though a wagon isn't a must). Review: We have enjoyed walks, roller blading and bike riding along this path. We put the young kids in a stroller and push them along or sometimes they get out and walk and even ride their bikes. We like to look for wildlife along the way (mostly birds) and enjoy the view of the Ogden River along the path and try to identify some of the trees that surround the path. As you pass the Ogden Botanical Center, heading away from the Dinosaur Park, you will come upon a fun spot we like to stop - Lorin Farr Park. The kids like to take a break and play and then continue on the trail after. We have enjoyed seeing the murals on the walls of the building just past Lorin Farr Park, it has brought up some good discussions about our country's history and culture. It's nice to have a place we can go that is away from traffic and is fairly flat the whole way so they little kids can just go. We are excited to try out the new "fitness stations" they are putting in. This trail has become a fun outing for our family. The airplane of the Candy Bomber! Review: I've had this museum in my sights for years, namely because we've driven past it on our way to Salt Lake for years, and as a homeschooling field tripper, I can't help but feel a little guilty passing somewhere year after year without checking it out. So finally we did! And WOW! A natural hit for me for the cost (free!) and lack of crowds on a Friday afternoon. AND I have a little guy who LOVES airplanes, and this museum is FULL of them. The kids were bummed they couldn't actually climb into any of the planes, but you can get up close and personal with the planes both inside and out. Aside from general airplane interest, it's a great place to learn more about the Cold War, women pilots, prisoners of war in Vietnam, or the beloved Candy Bomber of WW2, Gail Halvorsen. The other thing I loved about this museum, that we didn't utilize this time around, was the Air Force Veteran Volunteers. We went completely unprepared with specific questions or curiosities. But we found quite a few volunteers available who seemed friendly enough I wished we were able to pause and glean their wisdom and experience. It's nice to know where to find great, living resources who are willing to share! We were there for almost 2 hours and barely laid eyes on it all! Due to an event at the museum that evening, we completely missed the flight simulation corner, which the family we were with raved about. But in general, Fridays are the best time for a random group of homeschoolers to catch it open. (Otherwise you can pre-arrange for it to be available for groups Tuesdays through Thursdays.) We also didn't utilize the photo treasure hunt on the desk near the entrance. I have loved such resources to maintain interest and keep us learning and moving through museums. I don't know if we learned a ton, but movement was NOT a problem. Seriously, so much to see we could go back another 3 or 4 times and still find new things we hadn't noticed before. Review: Did you know we have a Catholic Monastery in our very own backyard? My kids were shocked to learn this, and excited to check it out after we'd learned a bit from history about some of the roles played by the Catholic church and of monasteries. I've mentioned the disaster of our field trip to the Abbey of Our Lady of the Holy Trinity in a previous post, but that was due to MY kids having an off day. What should be said about this destination is this: It's a perfect day trip for the fall when the leaves are turning. It was a GORGEOUS ride there. And the town of Huntsville was darling and called to me to come play, relax, and enjoy the reservoir in the summer. As for the Monastery itself, there isn't much to see. The bookstore is small. If it had been manned by a monk, we may have enjoyed a visit, but a volunteer from the community was there and very occupied with another patron. Otherwise, we timed our visit just right and were able to catch a prayer period at 12:15. It lasted for only 10 minutes, which was 5 minutes too long for a 2 year old, but just right for a 5 year old. If I had older kids I would try to catch the evening Vespers at 5:30. Perhaps because we saw a minor prayer period, or maybe simply because there are not many monks left at the monastery (11 total, I think, at the time of our visit which is greatly diminished from the monastery's glory days), there was only a few monks who prayed Sext. So it's not Sound of Music in any way, shape, or form. But if you go with simple expectations, you will likely find it interesting enough. Cost: Homeschool Rate of $3/person! Review: My kids, in breaking with the norm as I suppose, aren't that into dinosaurs. Not one of them. Not yet. So it's significant that they love this park. And who wouldn't? The dinos on display are in full color (rather than just the bones) posed around outside, so there is a sense of discovery as you find them hidden behind trees or tucked away into some bushes. AND there are sound effects to boot. The museum also offers "Field Books," to pull the less engaged through the displays to learn. The books are darling, free, and you get a treat for filling them out. Pre-readers will LOVE the playground. Heck, everyone in my group loved the playground. Give yourself at least a couple of hours, and bring food so you can linger and relax, while you enjoy all there is to take in. Rock and gem/geology enthusiasts will love the displays inside upstairs. MY kids preferred the fun holograms and Jurassic Park-like animatronics display found there too. If you leave wanting more, however, you should consider a family membership to the Ogden Nature Center - so keep reading! Our family loves to explore the Ogden Nature center trails, which offer a sense of freedom for the kids and an opportunity to observe the evolving beauty of nature through it's seasonal changes. There are rescued birds of prey in enclosures to view and read a bit about. Also gentle deer who roam freely throughout the property. My Kids and I especially enjoy attending on Wednesdays so that we can combine free exploration with a fact-filled and kid friendly nature class at 3:45 pm. The instructors are extremely knowledgeable and encourage inquisitiveness in the kids. The topics vary each week. All of us learn a lot! There is also an eclectic outdoor exhibit to meander through, a fun gift shop, and a few additional indoor nature activities for younger kids. All in all, membership at the Ogden nature Center ($45 for a year's family membership which includes Thursday admission to Tracy Aviary and Mon-Thursday admission to the Ogden Dinosaur Park) has been a joyful investment of both time and money! Review: This is one of our family favorites. In fact, we volunteered here over 5 years ago, and if you LOVE it too and want to be a pioneer when you grow up, consider volunteering. (In fact, you can SEE me and my big two from our volunteering days on their website - click the link above. Me and my oldest girl are the first picture displayed on their "Jobs and Volunteers" tab, the volunteer page. The second picture if you click the right arrow on the picture itself, is my big boy when he was 4!) 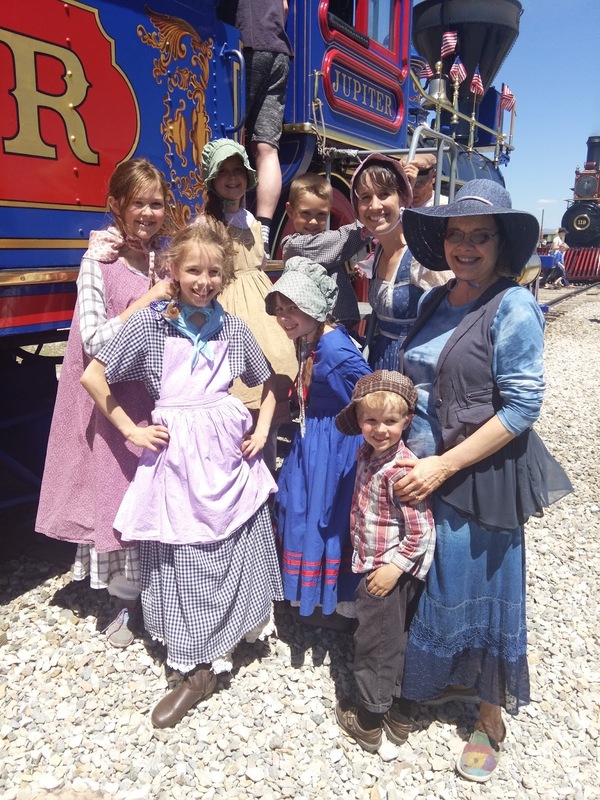 Anyway, there are a lot of fun things to do and see - big train rides, little train rides, pony rides, a splash pad, panning for gold, crafts, a petting corral, and mini village play area. We left after 3 hours only because we had somewhere to be. To maximize learning, ask a lot of questions of anyone dressed as a pioneer. They know a lot, but often don't dump info on you - which is nice if you have wiggly kids who want to get to the next thing, but too bad if you are shy or not sure what to ask. More is up and staffed in the summer, but the Candlelight Christmas is also a delight. Note: for free you can check out the monuments outside the park - call it a hike and take it all in! Review: There are a lot of cool/pretty things to see in the State Capitol building - great murals, busts of historically significant people, painting of Utah's governors. And it seems things are geared up for visitors during the summer. We liked the retro elevators, but my 2, 4, and 7 year olds are into elevators.... If you do the official free tour you get into a few more places than showing yourself around, but we just tried a lot of doors and found enough to interest us. Pop your head into the governors office for sure. I'd like to come back when our state legislature is in session, but I'll have to wait for older kids! (When I do, we're eating in the cafeteria in the House Building behind the main capitol building - just to see who we can see and take in the governmental air! :) Also, the grounds are lovely so be sure to stroll around the outside of the building too! Info on the Ensign Peak hike usually describes the hike as easy. I think that is because it is short. But it is fairly steep if you aren't in shape, or are carrying heavier little people. (I carried my 2 year old, but he is a feather-weight.) If you have crazy runners, there are some steep drop offs to mind. But the views are fantastic! Plan this hike taking a good hour if your kids can keep a good pace. If they go slow or like to rest, it will take more. Also, there are no near-by restrooms (at least not when we were there that were open) but there is a nice mini-park directly across from the trail-head. It seems under-used, but is quite lovely - a great spot to rest and enjoy a snack in the shade. Review: I grouped these two because they are within 3 blocks of each other, and share the theme of people around the world. The gardens are one of my family's favorite spots. We toured welfare square with 3 other homeschooling families. 15 kids, ages 10-1, and 4 moms!! The tour guide first shows a short film on the churches welfare program. Then he walked us around the entire facility. We first learned more about the Bishops Storehouse. Then we went into the warehouse and saw the pallets of food and supplies. We walked over to the bakery and could see the volunteers, slicing and bagging the bread. There are large windows for everyone to see, though the little ones needed to be lifted up. He was great to answer any questions anyone had. Next we headed over to another building, the cannery. Again through the windows we could see them bottling tomato sauce. The kids loved seeing the process and all the machinery involved. We had 4 strollers with us, with no problems. Plenty of room for everyone! Our last stop was the dairy. They were just cleaning up the after having made cheddar cheese. But we got to watch them cut and package it. And the guys in the cheese making area were washing down the floors and equipment and sprayed the windows which the kids thought was hilarious. At the end of the tour we sampled cheese, milk and chocolate milk. Our guide was great with the kids. He spoke on their level and answered questions from the adults as well. It took us maybe an hour to go through all of it. It is all in the same complex. You just walk from one building (you go outside and walk on the sidewalks) to the next. The library was one of my 7 year old's favorite spots. And, as I mentioned above, my kids LOVE elevators, so these are worth riding! They are encased in glass, all except the floor, so not only can you look out, but you can look up too, and you can observe the workings of the elevator as it moves. The children's area is gorgeous with a fun attic and ice cave to enjoy reading in. We also took the elevator to the roof, which was a lot of fun, and you can picnic up there and walk down the outside of the building. Also on the fifth floor is a window outside of which are two beehives you can look into and see the honey comb with live bees hard at work. My 4 year old thought this was awesome! And with any library, there is always something going on, which is why the link above takes you to the events page. Time: for the price, stay as long as you can and go when there won't be crowds! My mother wanted to take the grandchildren to The Living Planet Aquarium in Draper to see the exhibits. It is quite expensive if you ask me, but Grandma was footing the bill on this one so we went. The facility is huge! Very stroller friendly. I didn't notice anywhere super convenient to nurse my baby, so we sat in the food court area and it wasn't awkward there. The website indicates no outside food, so we bought lunch but there were public school groups with sack lunches, so I don't think it's highly enforced. Wished we had packed our own. We first wandered through the South America exhibit - large and fun and had several pools that you could touch a few animals. The staff at many different spots were happy to answer any questions we had. We wandered at our own pace. It was fun to see the birds flying around in this building. Upstairs we enjoyed crossing a rope bridge and my children especially liked the frog exhibit! The penguins were fun! There is a large viewing area were you get to see them swimming under water as well as standing on the cliffs above. The Utah exhibit was probably the kids least favorite, but it was interesting and enjoyable to walk through. The ocean area was our favorite. It was somewhat dark in there and sometimes hard to see into the exhibits, but each area has a description and picture of what was in the exhibit so that always helped. Those descriptions are in every area we visited. There is a sting ray pool where the kids could touch them and see them up close. The kids were disappointed there weren't bigger sharks in the shark tank, but it was fun none the less. There were all sorts of aquatic life to watch. There is a tunnel to walk through where you see them swimming over you and all around you! We spent about 4-5 hours at the Aquarium. I'm glad we experienced it, but for the price, once was enough. You can get info on their web page about school group rates and programs. At a glance it looks much more reasonable to go as a group. If you want to save the money, check out Scheels. Yes, I know it's a sporting goods store. But from Salt Lake it's a shorter drive and more convenient. They have a cool salt-water aquarium inside, plus a bunch of stuffed animals on display. AND you can take a huge feris wheel ride there for $1. You can probably spend about the same amount of time in the store as the aquarium, and get a ride to boot for A LOT LESS MOULA! Review: It's just hard to beat free. For free, this is a very cool museum. I don't know how often displays change, but we were able to catch a big one about the Bingham Copper Mine, which is nice because the actual mine is presently closed to visitors. Generally, the museum seems to be a good mix of old and new art and even some artifacts. Almost nothing to do (probably typical for an art museum) but plenty to see. I liked looking at painting dates and telling my kids what was happening in the world at the time the art piece was created. One other successful way to engage them was to pick a space (like a room or wall) and ask them to find their favorite piece in that space, stand by it, and tell me why it was their favorite. This helped them to have an interest in seeing it all, and allowed me as I shared my favorites, to model different things to note or appreciate in a piece of art. AND it was fun! Time: We spent the better part of 3 hours here including eating, but could have spent more time, if we had it. Review: This really should be a review of going for the first time on a free day. So let me say that the museum offers tickets for free days. You can reserve up to 6 seven days in advance by visiting their website. I was away from a computer when the tickets became available and asked my husband to do it for us. He didn't have nice things to say about the reservation process. Said the site was clunky and it took him several attempts to get it to work. But in the end, we had 6 tickets waiting which we didn't appear to need. We arrived at 11. My friend who came to meet us before 10:30 found a parking spot in their smallish lot. At 11, there was no space left. I won't reveal how I came to NOT enjoy an uphill hike from parking in the heat or take a shuttle from many blocks away. But I would strongly advise getting to the Museum early. When we left at 2, new groups were stalking folks in the parking lot to find a spot. I was a big fan of this museum way back when it was in an older building near the University of Utah's main campus. Back then, they had a free day once a month similar to the art museum. So the free days were not over-crowded. I am not a huge fan of crowds. Probably as an individual, or with another adult, I don't mind them as much. But trailing 2 very young minors while managing a stroller can be a challenge. THAT said, this museum had a lot to see, and the kids loved seeing it! I recommend to families pushing strollers to take the elevators to the 4th floor and work your way down through the exhibits. Everything is nicely arranged around ramps. Exploring this way, you work backwards through history, instead of progressing from dinosaurs to animals today, but certainly the kids don't mind. The dinosaur bones were my kids' highlight, and walking down through, you finish with a "grand finale." The displays are huge and as you wind your way down (or up) you get to see them from multiple angles, which is GENIUS! There is a fair amount of hands-on learning to be had. If you can find a quieter time to go, kids would likely enjoy quite a bit of exploration and learning. When things get crowded the last thing you want to do is hang around waiting in a line to try something. Also, while there is TONS to see, there are only tiny signs explaining what you see, so in a crowd, you hate to stop and read and hold up the line, or wait for people to step aside to allow you to get to the sign. Review: I am afraid of birds. Odd, I know. One of my worst nightmares involved John Travolta and a bird flying near my head. SCARY! That said, I LOVED the Aviary. Probably because my kids seemed engaged and excited the entire time we were there. We didn't purchase any of the extra bells and whistles, but still had a great time! We were most wowed by Andy, the Andean Condor. HUGE! But we delighted in walking around, taking the birds AND nature in. The whole place is lovely. The kids found a lot to interact with AND the displays were a great mix of at-a-glance cool info and details for the slower, info-driven explorer. Were it not for a pick-up deadline, we could probably have stayed to enjoy the place for another hour or more. LOVED it! Review: Once again, these are lumped by proximity - the synagogue is a stone's throw from the nature park. However, we did not do them on the same day. The nature park is a fun and flat city hike (outside of the incline to get into and out of the Nature Park.) We enjoyed the fun trails and the adventure and discovery that came with it. It IS an off-leash dog area which is something to note if you have little ones afraid of being discovered by a fast moving, large canine. (Also, some dog owners apparently think their dogs' "business" left about in public places is cute. I'd like to find these owners and leave my kids' poopey diapers on their lawns. Be aware of the possibility of these "mines" and give your little ones a heads-up.) One final note: restrooms are a good walk west of the nature area trail head (100 yards-ish), so go before you head down. Anytime I can get an informative tour geared to the interest and pacing of my little kids, I'm going to give it two thumbs up, and I must say, we LOVED Kol Ami. Our tour lady (whose name over a year later I don't remember) was fantastic and we learned so much about the Jewish faith which I found beautiful and inspiring! We did just happen to show up one day with our Culture Club so we lucked out, but if you don't want to chance it, call to be sure someone will be there and available to show you around. Review: Museums have a hard balance to strike. They need to engage all learning types, all ages, and offer enough to see and do to make a visit worth it, but not so much the mind goes on overload and doesn't retain any info. The Leonardo is a newer museum, and MY take is it's still working on finding this balance. On hearing positive reviews, we got our family memberships without having gone ever. I hope at the end of one year it feels worth it. The upside of a membership to this museum is that you have more time to explore. And being named after Leonardo da Vinci, one would expect a lot of exploration and hands-on fun. MY challenge was accompanying multiple children who all have a different idea of where they would like to spend time. The hands-on areas were also well used and messy - this didn't bother the kids, but my feeling was that SOMEBODY was a genius to charge all this money so kids could play with other people's garbage scraps. And the less interactive displays were way too wordy to bother with if you go with anyone under age 10. (Who wants to stand there and be read to when there are cooler things to see and do? Probably why I equated the word Museum with BORING 'til I was in my teens - because some well meaning teacher was trying to help me learn something by standing and reading to ME. Yeah. Boring!) So, if I didn't have a membership, I think this would fall in the NOT worth it category. THAT said, the kids had a lot of fun, and we DO have a membership, so we will be back for more and I hope to report we missed a lot and I was totally wrong. One final note: We totally lucked out and went to check out the Leonardo exhibit Animals Inside Out on a day when admission was just $2.50. Totally worth it at that price. The kids thought it was very cool! However, regularly it would cost us members $10, and $15 for an adult non-member. It was worth the $5 I payed for my crew to go through. It would NOT have been worth the $20 it would cost the same people to go. BUT my 11 year old missed out, and I WILL pay $7 to have him check it out when we are there next. It's all cool. But there just isn't $15 worth of cool. Certainly not for kids much younger than 7. I guess I'm basing that on the fact that I did spend time and energy to engage the kids and we learned a bunch. Still, there isn't more there than about an hour of stuff to see and learn. So for a family, it's a really pricey hour. Review: This sweet spot with the creek that becomes THE creek of the City Creek Mall is so fun. Next to the International Peace Gardens (see above), it is my second favorite. But I'm a history junkie and have an incredibly soft spot in my heart for those who have lost their lives in the armed forces. So I loved the Meditation Chapel and the other monuments. The beauty of the park was not lost on my little ones. And there is a nice tranquility there, maybe because it's off the beaten path. On the far north end of the park (look for a small cement and stone bridge spanning the creek) there is a trail head for a well shaded path that winds through the ravine. We didn't make it far at little-people pace - which I suppose means there is a lot to explore and lots of "doggies" to stop and pet and shy away from. There were a few picnic tables, but no bathroom that I am aware of, so go before you go, if you know what I mean. Also, you can park on the street approaching the park. It is zoned for a 2 hour time limit, which should be plenty to do the hike, or take all of the monuments in. But may stretch it if you want to do both. However, if memory serves (and it may not!) the parking across the street to the east of the State Capital Building has no time limit and is in good supply. There you will find a trail and staircase that descends into Memory Grove. (If you only have 2 hours on a hot day anyway, park below where there is shade.) The gates to Memory Grove itself are usually closed, which is fine because parking inside would ruin the feel, and be incredibly limited anyway. Final note: You can also grab a free sack lunch from the government near this park from 11:30-12.
Review: I must confess the state of my people for this museum. My little 2 year old was under-slept and was howling to be let out of his stroller so he could run around and attack the exhibits. My older 3 were hungry. So we did NOT spend the time the museum deserved. So, as we sped through, warding off melt-downs of various kinds, I was able to appreciate a few things. First, the cost. Free is hard to beat. Unlike the Museum of Art at the UofU, this one is ALWAYS free. It is a tad smaller, but MY kids don't have the kind of art appetite that takes in a whole museum of art anyway, so the small size was just fine. We were there for "Cut," an exhibit featuring 40 historical costumes from movies. So we got to see THE ACTUAL clothes Johnny Depp wore playing Jack Sparrow. Hard to beat. Well, actually ALL the lovely, historic gowns beat Jack Sparrow's get-up. And it was cool to read which stars wore what. I could go on and on about how thrilled I was my fashion-interested girls saw this, but this was just a temporary exhibit. It seems the museum brings in some great stuff from around the world and is worth it! Visitor parking is on the north-east side of the museum and is very convenient. Review: This museum was actually our first stop. We parked in the Art Museum's parking lot and walked up the ramps (my kids called them the "Disney World of Sidewalks" - gotta love small pleasures!) to this museum. (If you do the same, the entrance to the building is on the east side. OR if you want to park closer, there is a lot on the north side of the Life Science Museum you can park in and get a pass for once you come inside.) This museum was lovely too. Free is hard to beat. And the displays feature mostly the real animals (dead and stuffed, obviously) so you get a sense of scale, which is thrilling for animals like elephants, giraffes and leaping lions and standing bears. The museum doesn't overwhelm the visitor with too much information to take in. My kids just wanted to run from animal to animal to see who would first spot the next cool thing. I'm sure we'd learn more on a second visit. THAT said, I don't know that there is so much there a third would add a whole lot. We probably spent between 60 and 90 minutes there. If the kids had slowed down, we could have learned more and maybe even been done in 2 hours. I must say, I preferred this over the zoo. First, you could get closer to the animals, and second, how often when you go to the zoo are the animals just laying around? Here, they were up to much cooler business (albeit very frozen business). Other notes: we missed the live animal encounters, but those do happen daily; and there is a good nursing spot in the basement ladies bathroom, but otherwise the basement isn't worth going down to see. Oh, AND we were there on a Saturday morning and it felt almost like a ghost town - so lovely to have it almost to ourselves! Review: This was the spur of the moment back-up when we discovered the Museum of Peoples and Cultures was closed. I am a sucker for old buildings! This one is the origin of BYU - the old Brigham Young Academy. (And if you are a fan of the Great Brain books, the school Tom Fitzgerald actually attended. Cool!) So the building was fun. And it had a great children's section that the kids killed a lot of time in. I really like "The Attic" - a gallery on the 4th floor. The exhibit we caught was of original "Loony Tunes" still gels. The kids were thrilled it was cartoons, and we learned about how cartoons are made. Again, this exhibit is not permanent, but it looked like more cool stuff was to come. Cost: Tours are free, though donations are encouraged. Food is cheap - $6 for an adult plate; Festivals are also cheap. Review: (this was not on our most recent trip to Utah County, but part of our summer adventures. Read more about them here.) So if it isn't yet abundantly clear, I am a cheap skate, and first of all: OUCH! Wow, does that price tag sting! So if you've plopped down $51 dollars like I could have, you'd better have a great time, right? (Well, I was a guest with my sis-in-law who has a Thanksgiving Point membership, so we didn't pay THAT much. And STILL it WASN'T cheap.) We went when my sis-in-law hoped it would be less crowded - the middle of the week, around 4pm so right at dinner time. Our plan was foiled. The place was CRAWLING with kids! I couldn't imagine it MORE crowded. (I'm sure it could have been. I just have low crowd tolerance.) Anyway, my kids don't suffer from the same throng-phobia so they walked in, their jaws dropped, and they thanked me before doing anything, for bringing them to the best museum of their lives. They LOVED it! They climbed, crawled, leaped, sprayed, reached, jumped, felt and saw as much as they possibly could. We were there 2.5 hours and could have stayed longer but we were STARVING. If I had it to do again, I would plan 4+ hours at this place and bring food for a picnic if we get hungry. That said, though the kids would be thrilled, I don't know that I would do it again. Of all the museums, this one delivers the info in the most fun, engaging way. But there isn't a lot of info to deliver, so outside of the fun, physical nature of the exhibits, my 11 year old isn't going to learn a lot. Not enough to merit 2 visits. But that assumes he DID learn on the first visit. And in a place so packed, though you may want to take your time for some fun and simple instruction, if you do, 12 kids will jump in front of you, or 3 toddlers will be wailing where you are standing so trying to teach or learn anything begins to feel incredibly futile. (Speaking of toddlers, having one is a blessing. Going to a place this crowded with anyone else besides a toddler makes the protective mother in me cringe. It's a stranger-danger nightmare.) So yes, in my kids' dreams we go back. And IF we do, it will be a SCHOOL DAY from like 2-6 (to avoid field trip throngs), and either dad will be there or my two year old won't. Review: This year (2017) our family is studying American History, and we have just completed a month focusing on "westward expansion." So this museum seemed like just the thing, despite the travel time of 1 hr. 45 min from Logan, UT. We heard other homeschoolers were interested in coming along, so we put together a field trip and only later realized how much money doing so saved us. The "Living History Tour" was apx. 1 hour. We began in the basement in a room full of actual artifacts from the mid 1800's. The docent there was incredible with the kids' varying interest levels and ages. They got to hold a brakeman's stick, push buttons on an old cash register, and touch a silver coin. We spent about 30 minutes in that room. Though it was interesting and informative, in lay-out and content, it was VERY similar to Logan's Daughters of the Utah Pioneers Museum AND to the Pioneer Memorial Museum in SLC (link listed above), and both of these museum are free. The other 30 minutes of our tour was the "living history" part. Costumed docents took us through a gun shop, to see a wagon, into a store for "supplies", then loaded us on a wagon where we heard recordings of actual pioneer journals of the trail as the wagon lurched along, and finally wound up in a wagon circle at night for a few more stories and a rousing cheer of "Oregon or bust!" 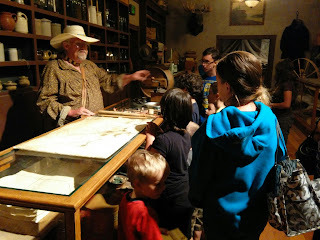 The docents did a great job, and the kids loved the wagon "ride" but we all felt like we would have loved another 2 or 3 "stations" and more information. If we had payed full admission prices, I would have been down-right disappointed! This museum is on the way to Jackson Hole (and Yellowstone if you are going that way). If you are going anyway, it might be a pleasant pit stop. There is a nice playground outside the kids enjoyed while we picniced. If you are contemplating making this museum the destination, I would recommend taking friends along (it didn't seem you needed a minimum group size to make it a field-trip - just get it scheduled by calling ahead), and come back through Bear Lake and Logan Canyon at a leisurely pace. (The canyon is beautiful and my kids love the free beach at the Garden City Park, a few blocks south of the T where the road through Logan canyon meets Garden City's main road through town.) Raspberry shakes top off every trip through this area!